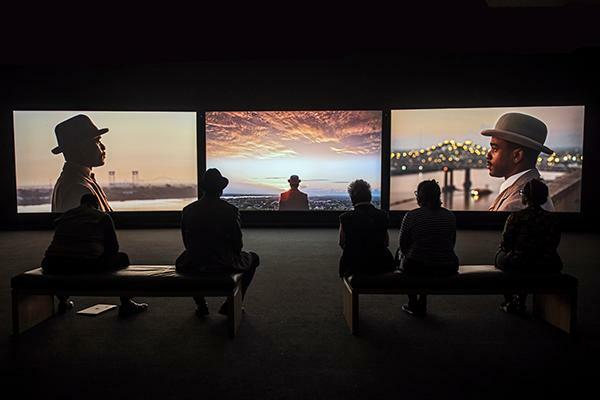 Please join the Franklin Humanities Institute at the Nasher Museum of Art for this exhibition closing event on John Akomfrah's Precarity (on view until September 2)! RSVP at precarityakomfrah.eventbrite.com for our catering numbers. The Franklin Humanities Institute at Duke University presents an interdisciplinary panel of humanities faculty on Precarity, the three-channel video by acclaimed British filmmaker John Akomfrah. Precarity is about the life and myth of Charles "Buddy" Bolden, the New Orleans cornet player credited as the first jazz musician. Part documentary, part costume drama, part music video, Precarity addresses history, memory, mythology, cultural identity, health, race, and many other issues facing U.S. society today. This event is part of the Franklin Humanities Institute's Water series.